Thanksgiving - the act of giving thanks, a prayer or expression of gratitude. 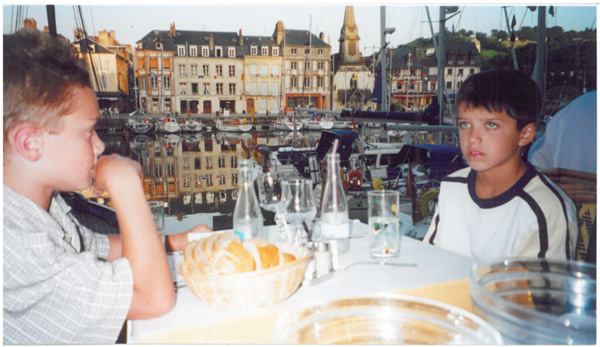 One of our favorite family destinations in Europe is the village of Honfleur on the Normandy coast of France. 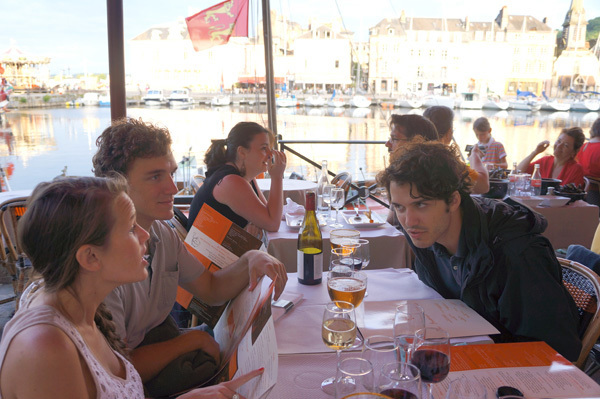 Normandy is divided into Upper and Lower Normandy by the Seine, which flows northwest from Paris and empties into the Atlantic between Honfleur on the south side of the estuary, and Le Havre on the north. 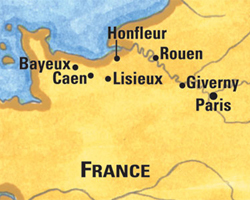 Incidentally, the Normandy ‘D-Day’ beaches are to the west of Honfleur, near Caen and Bayeux. 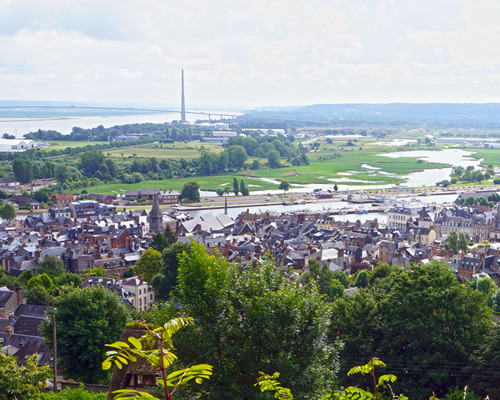 The image at the lower right is taken from a hill in Honfleur, looking east, and shows the river and bridge crossing the Seine to Upper Normandy. 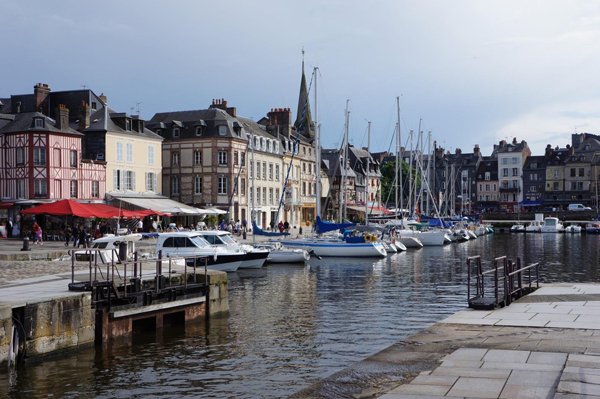 Honfleur traces its origins to the 14th century- the city’s position at the mouth of the Seine made it a vital location for protecting that route to Paris from the English during the Hundred Years War. Except for the earliest fortified structures and fortifications near the mouth of the harbor, the architecture and overall design of this town are not a result of an original city plan. The street layout has resulted from the dictates of everyday life over several hundred years. The street pattern is much more haphazard than we would find in any similar-sized American town. It’s a bit disturbing to realize that such a romantic and lovely place was developed without much apparent participation by architects! (Right)- Krier's point, a good one- is that the simple grid of streets we see in a lot of American towns, like the first image at right- could be a lot more interesting with an added twist. The plaza space or central point created in Krier's drawing at far right causes drivers and pedestrians to slow down and experience a place, rather than just an intersection of roads. 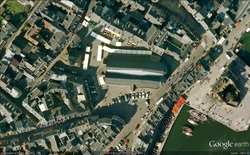 (Right)- One of the central plaza spaces in Honfleur is at the intersection of roads surrounding Saint Catherine's Cathedral. 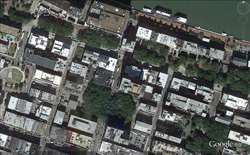 This Google Earth image shows the apparently random arrangement of streets and buildings that create an almost infinite number of memorable places leading up to, and within, this central gathering space. This image shows white tents set up for the Saturday produce market. Cars and pedestrians coexist here with no obvious problems. (Lower right)- Savannah has a very interesting city plan as well, but is far more ordered. Savannah’s city plan is, of course, based on an original design that has been followed over time. Many European towns develop an infrastructure that evolves based on historical paths. I am fascinated by Saint- Catherine’s Cathedral. It is not an architectural masterpiece like Chartres; it was actually built and, presumably, designed by the shipbuilders of Honfleur in the late 15th Century. This church, however, embodies the life of this town; the scent of 800 years of altar candles and incense is present here. It is an entirely wooden church. 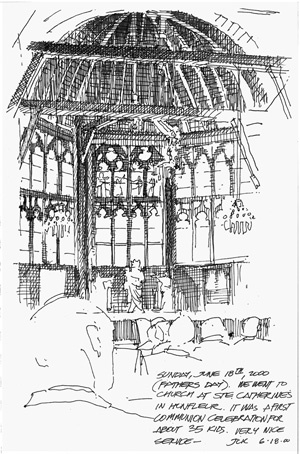 When we visited in 2000, we went to church there on Father’s Day and I made a pen and ink sketch of the interior (below, left). On this particular Sunday the town’s young teenagers were having their first communion- it was a really beautiful event. 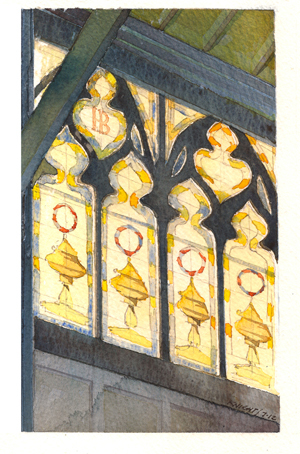 During our visit in 2012 I made the watercolor sketch of the stained glass windows in the apse (below, right). Again, there is nothing here that approaches the detailed stained glass work of the great cathedrals, where the most talented artisans of the time showed off their skills. These windows, and the detailing that surrounds them, were very important and complex features that the laymen who built this church thought was appropriate for their city’s cathedral. Copyright © 2019 Knight Architects, Inc. | Web Site by Kapp Koncepts.